Wildlife. Photography. Fishing. With the world around us becoming ever more precious, now is the time to take the opportunity to explore and visit nature in all her natural beauty. Few people will ever have the experience of swimming with dolphins or whales, watching life on earth as it was a thousand years ago in Galapagos, seeing penguins queue for a diving competition or feeling the sublime beam of pure blue light radiated from an iceberg. In warmer climes such as Indonesia and South Pacific, remote islands, lush with rare flora and fauna remain untouched by ‘modern’ civilization. Let us help you plan a private charter to take you into you own world of discovery. A limited selection of notable private yachts and their highly knowledgeable crew are available to carry you into the heart of these worlds. 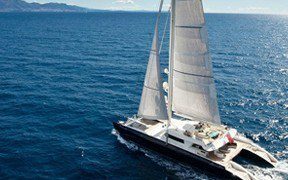 Individually equipped with all the gear necessary to fully enjoy the chosen cruising area, these yachts carry everything from sonar and camera/film equipment to qualified guides and total comfort on board. Many of these yachts are only in each area for a very short number of months – so – ‘Carpe Diem’ – ‘Seize the Day’ and know that you have lived a dream that most others will never know. Only this way can we truly understand what is happening on our precious planet. 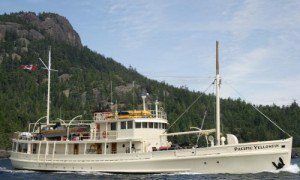 Alaska and the breathtaking Pacific Northwest offer myriad cruising opportunities. You will find long hours of sunshine and a sky filled with eagles by day and a seamless, star laden universe by night. Seals, salmon and Orca whales inhabit the clear waters and pristine coves lined with fragrant emerald pines and huckleberries entice you to explore by kayak and hike or bike ashore. Fishing here is second to none. Cast your rod, dig clams, prize oysters from the beach and haul in your own pots of Dungeness crab. These enchanting waters with unspoilt shores, coves and islands have been largely inaccessible to the luxury traveller until now. A handful of well serviced local airports and the flexibility of sea planes have brought them into arms reach. In the Arctic region, between July and September, it is possible to explore further as the ice packs melt. Here you may see polar bears, walrus and even an arctic fox scavenging on the flow’s edge. And it is here that the colours in the icebergs shine like giant aquamarine gems and the Northern Lights/Aurora Borealis illuminate the heavens. Breathtaking scenery is the canvas to a fascinating painting of polar discovery. Glide through the ice packs where penguin colonies vie to have their photos taken, watch seals slide into the water alongside you and minke whales bask in the stillness. Endlessly long days of clearest air, punctuated by Daliesque sunrises and glorious sunsets should put you in the mood for a sumptuous dinner aboard your yachts. Patagonia, resting at the southern tip of South America looks out over the edge of the world. Shared by Chile and Argentina with a backdrop of the Andes, the archipelago of Tierra del Fuego is a maze for exploration. 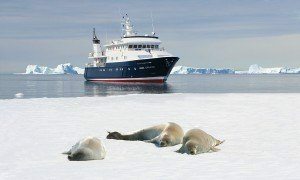 Rich with wildlife, abundant vegetation and thriving marine ecology this is a superb cruising area for charter. You can make this the start of a charter that continues on down to the Arctic. Lying 1000 miles out into the Pacific Ocean, the Galapagos archipelago consisting of some 20 islands, is home to the most extraordinary range of indigenous wildlife. I have spent seven months here and long to return to explore more. A small, private fleet of specialized charter yachts will guide you through the most amazing journey of discovery. Swim with baby seals and penguins; watch the marine iguanas as they bask in the sun before diving for food. See great colonies of frigate birds and the yellow, blue and red-footed booby birds making their clumsy plunges into the sea. Ride a horse across the volcanic ‘highlands’ and watch the ancient, giant tortoises as they meander through the long grass or the great iguanas forage for cactus flowers in the lowlands. Aside from life on shore there is an abundance of extraordinary underwater life. Gentle turtles that lay their eggs ashore, hump headed wrasse and sweet lip grouper, rare fish, dolphins, sharks, anemones and corals abound. To snorkel or scuba dive here is to swim in God’s aquarium. The yachts we recommend here are known personally to us. Their owners live in the Galapagos Islands (many of them are born and brought up here) and their Captains and Guides are passionate about these lands and surrounding waters. spectacular vegetation while waters dazzle with vibrant creatures. Comprising thousands of islands and coral atolls linked into chains and circles, these groups of islands and their waters welcome and embrace. Steep mountains tumbling with orchids and vanilla contrast against coral atolls carpeted in sand. To help you immerse yourself local culture and find the wildest places we often have local guides on board or we can arrange them ashore to give you the true ‘inside scoop’. From the Marqueses Islands where a wild pulse still beats through ancient temples and tikis through the motus of Tuamotus, Fiji, Tonga, Solomon Islands, Papua New Guinea and through to the Java Sea, Indonsia, Andaman Islands and beyond, there is an eternity to explore. 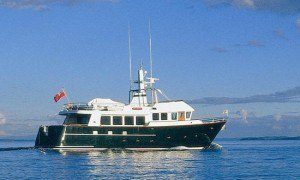 114ft motor yacht built by Billings Shipyard, Maine. 12 guests. 5 crew. US West Coast. From $79,000 pw. Contact us to discuss your next adventure – where-ever and however you plan to follow it.